Do I have something in my nose? Is my hair messed up or shirt un-tucked? Am I even speaking English? 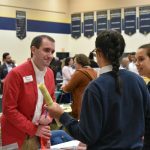 Many seniors ask themselves these questions the moment before they do the most nerve-racking thing in high school…public speaking. Every PA student must go through this horrifying experience in order to graduate. So why after four years of trying to help students not be so embarrassed and making them comfortable with themselves does Providence force seniors to speak in front of everyone for 9-11 minutes? Is it all a ploy? Does the administration want to see them fail and humiliate themselves? OR perhaps do they really care about the seniors’ futures and want them to succeed in life by challenging them to go out of their comfort zone? 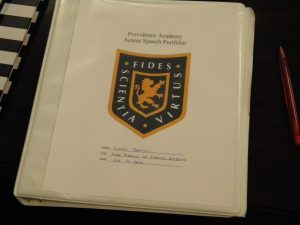 The infamous Senior Speech Binder containing the multi-step process to humiliation (a.k.a. character builder). Although students like listening to the speeches, they do not typically look forward to writing their own. Senior Isabella Halek, who was the first to give her speech, reflected that although she was writing about a topic she was passionate about she did not enjoy writing the speech. A common reason that seniors are so stressed about their speeches is because it tends to interfere with the time they could be working on their college applications. Halek also commented that she was happy her speech is over, but regrets not having time to work on her college applications. Many seniors choose to give their speech at a later date, after Christmas for example, so they are able to focus on applications first.Mrs. Simmons, the theater adviser, and also the teacher in charge of senior speeches, comments that although the speech is no easy project, the administration is simply trying to get the students ready for real world scenarios. A parent, Kenneth Barron, commented on how he wishes he had experience of giving something similar to the senior speeches because it would have helped him in his business. The teachers do realize the seniors are not in the real world yet, so advisers are assigned to each speaker. Advisers are a variety of teachers to help the students with the writing and research process. Mrs. Simmons said that the speeches are the students’ opportunity to”take everything they have learned and put it into action.” For this reason the administration does not want to move the speeches to junior year because the administration would need to enforce more regulations. Although the speeches may be nerve-racking and revolting to think about, this is not the intention of the administration. 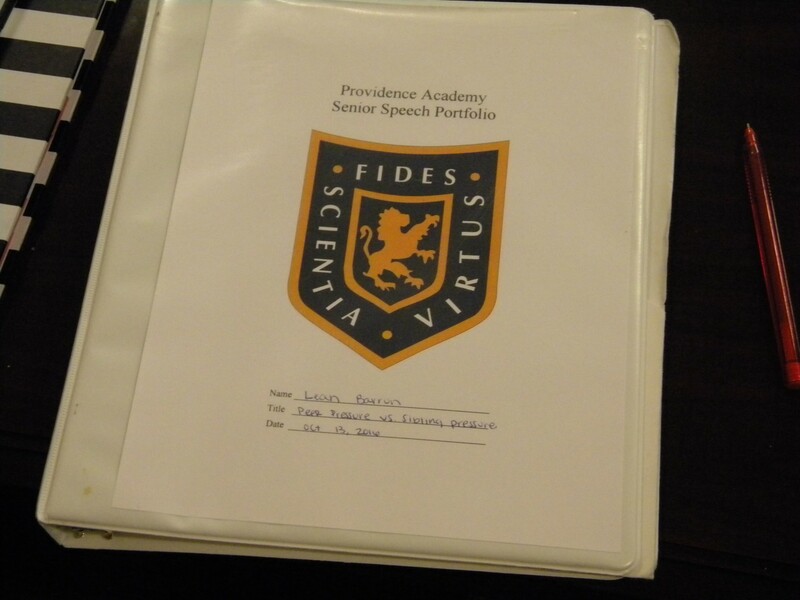 The senior speech’s purpose is to prepare seniors for life after Providence. Seniors should take a deep breath and know embarrassing moments are simply that, moments that will most likely be forgotten shortly after, but the life lessons will last forever. the quotes made the article all the more colorful and wonderful. WOW!!! SO RELATABLE!!!! I L O L’D anyways great job Leah B-!!! Loud Music Is The Devil!